In Great Britain there are still many ancient trees. The British even think their country has more old trees than the whole rest of Europe together. 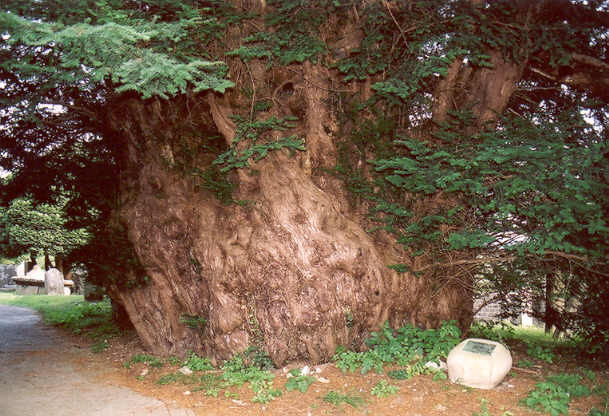 Probably the oldest British trees are the enormous big Yews, nearly all of them in churchyards. According to some investigators these should date from before Christ: older than the churches wich they accompany and wich should have been build near the Yews instead of the reverse. You can see some old Yews below and other specimen and a discussion about their age at the website of the Tree Register of the British Isles. Near old churches in Britain nearly always one or more Yew-trees can be found. Many of them are tremendous big and have the reputation to be very old. The Tree Register has already registered over 800 old Yews. Among these, the yews of the churchyard of All Saints Church at Ulcombe, just south of Leeds Castle in Kent, rightly deserve some fame. Two of them are among the biggest and finest in the country. Above is the first of the two, along the path to the church. It is also the lesser one, with a girth of 823 cm. A researcher thinks its age is about 1400 years. The second Yew stands beyond the entrance, aside the tower, and is even bigger: near the ground its circumference is 10 m, at breastheight even larger! It is among the biggest Yews of Great-Britain. The same researger thinks this specimen is even 2400 years old. There has been a lot of discussion about the age of Yews. For along time it was known they are old, researchers thought up to 1000 years. 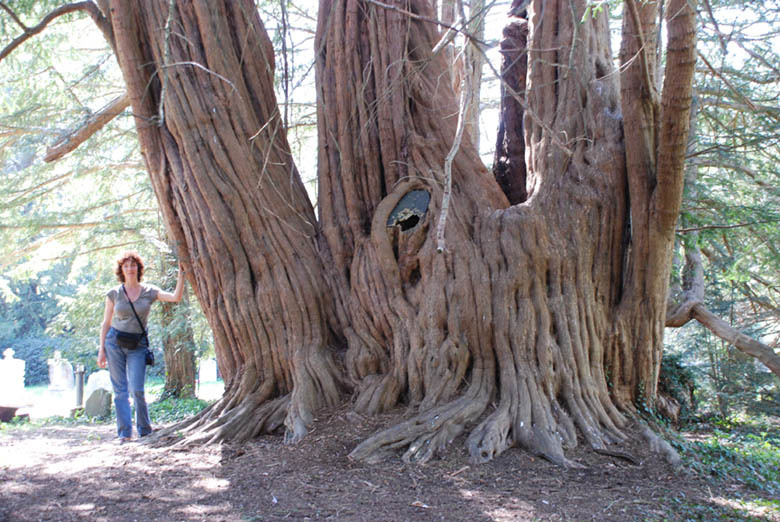 In recent years some researchers, especially Allan Meredith, have proposed even that the biggest Yews are over 2000 or even up to 4000 years, and in the case of the fragmented Yew of Fortingall, Pertshire, Scotland, even between 4000 and 9000 years. They don't have much hard evidence for this proposal, the Yews are invariably hollow because of heartwood-decay, so complete tree-ring data are not available. 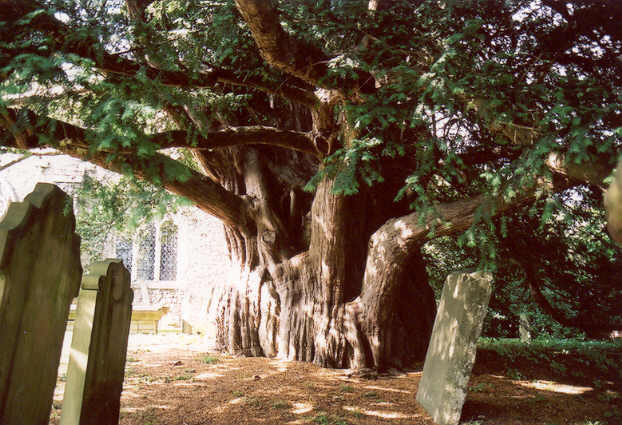 To my opinion it is not very plausible that Yews over 1500 or at most 2000 years exist, except perhaps the Fortingall Yew in Scotland, wich in 1759 was recorded to have a girth of 56.5 feet (around 17metres). Since then it has split up in several parts and cannot be messured anymore. Nevertheless these Yews are situated at Christian shrines wich were sacred places during pre-Christian era for Celtic groups. They revered the Yew as a sacred tree and could have planted them, but it has not been made sure that the original planted specimen survive till now and have not been supplanted by new ones later. One of the most beautiful Yews of the UK is this one, at the churchyard of Tandridge, a small village in Surrey, south of London and not far from the M 25. It looks multy trunked, but can be one tree in origin. Together the tree trunks have a circumference of 10,56 m (35 feet) near the ground. The yew does look very healthy, is somewhat hollow but does look not as old as some of its brothers as for example the Crowhurst Yew. 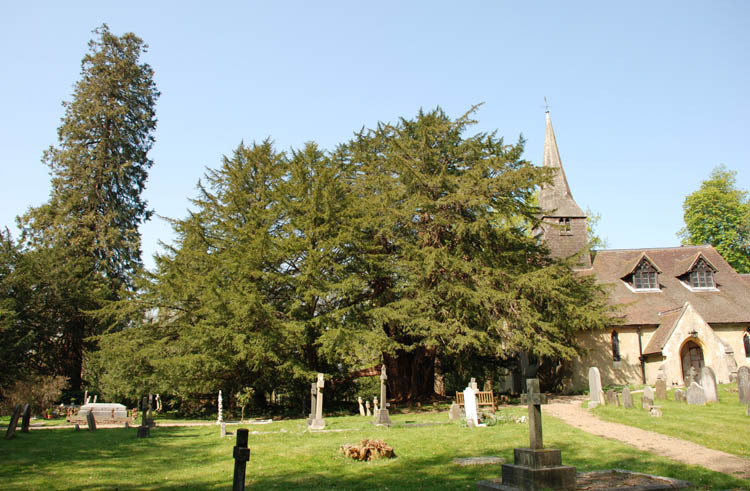 The Tandridge Yew forms a harmonious couple with the church. I has a very large crown for a yew. To the left a towering Giant Sequoia can be seen, standing along the road just outside the cemetery. 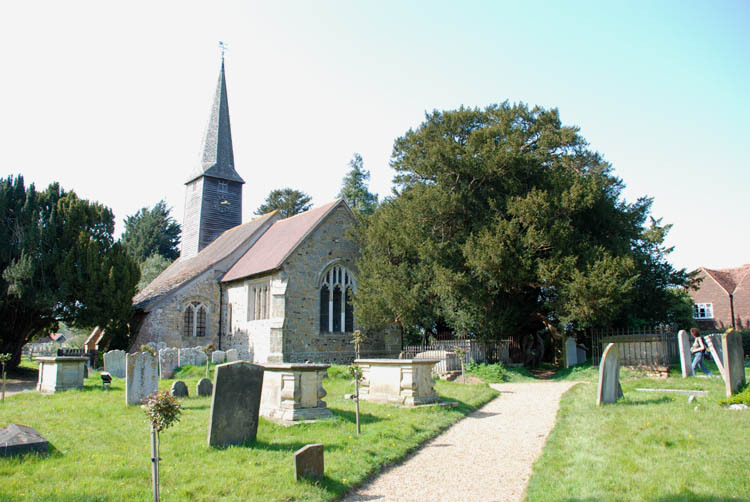 Just a few miles tot the south of Tandridge is the village of Crowhurst. Here a probably even older Yew is flanking the curch. 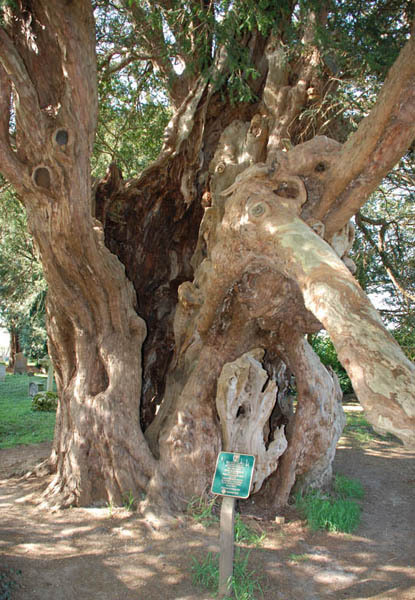 The common opinion is that it is amongst the oldest yews of Britain and could be around 2000 years now. This yew indeed looks very old, it is totally hollow and very gnarled. At Crowhurst this scenery can be seen already for many centuries. Inside the hollow trunk there is room for several persons to stand. 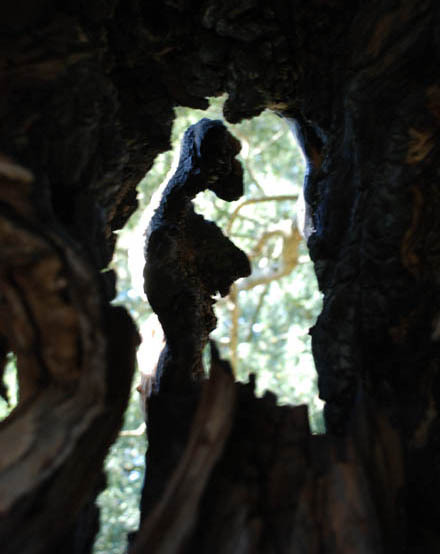 Also the tree has some surprices for the curious, like this nice silhouet.